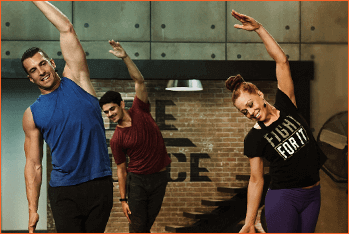 With CORE DE FORCE, you won't get a run-of-the-mill Kickboxing workout. You'll get a total-body shred that focuses on blasting belly fat—no equipment needed. In 3-minute "rounds," you'll alternate between MMA-inspired combinations, bodyweight training, and cardio spikes that keep you in the fat-burning zone longer. And that's just the beginning. Because each move, whether it's a jab or an uppercut, is rotational—meaning you get a 360-degree core workout that helps tighten up your midsection and shred fat off your entire body fast. All you have to do is hit it hard for 3 minutes at a time. Before you know it—you're done. And in 30 days? You've got your knockout body. Anyone at any fitness level can take on these zero-equipment, total-body workouts. 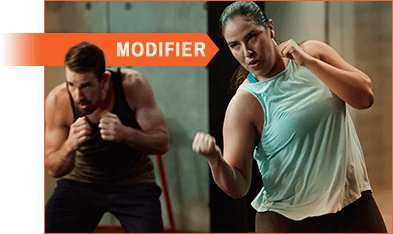 Just follow the modifier to do the workouts at a lower intensity until you’re ready to kick things up a notch. Plus, each workout includes a move-by-move breakdown to help you master your combinations from the get-go. 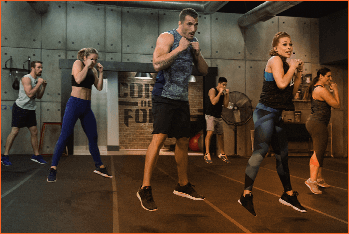 Using explosive and defensive-style movements, this fast-paced, cardio-conditioning workout will help you carve a tight, lean body. The quickest stretch ever. Do this quick 5-minute session before bed to help relieve tight and tired muscles—and keep you at the top of your game. With this Eating Plan, figuring out what to eat to get your knockout body is never a battle. 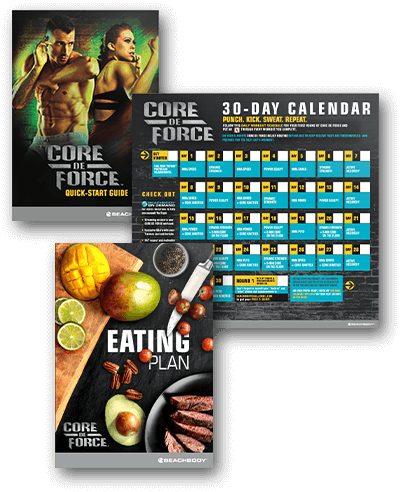 Inside you'll find everything you need to get results, including signature recipes, sample menus, and a revolutionary approach to eating MORE to fire up your fat-burning metabolism! It's a no-brainer. CORE DE FORCE works. And to prove it to you, go ahead and try it for 30 days. If you don't get the results you wanted, you can send it back—absolutely zero questions asked. You can even keep the Eating Plan, 5 Min. Core on the Floor and Core Kinetics DVD as our free gifts to you, just for giving the program a shot. © 2016 Beachbody, LLC. All rights reserved. 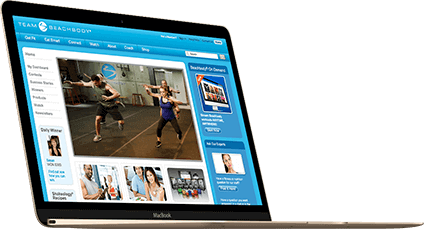 Beachbody, LLC is the owner of the CORE DE FORCE, Beachbody, and Team Beachbody trademarks, and all related designs, trademarks, copyrights, and other intellectual property.